We saw a drop of Canal New York accessories not so long ago, and hot on the heels of that we have three new items of apparel. The solitary hoodie is the Canal New York Logo Hood, which arrives in a simple Black colourway. The second L/S t-shirt is also the Fulm Festival LS Tee, but this time in Black. The t-shirt has been made using cotton, giving it a great level of softness and breathability that is very ideal as we approach the Spring and Summer months. The long sleeves feature ribbed cuffs at the wrists for a more streamlined fit, also ideal when skating, and the neckline is ribbed too to reduce friction when you're on the move. 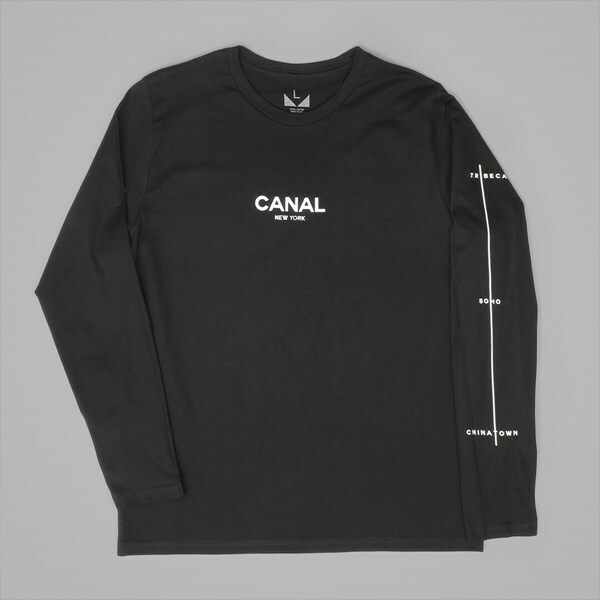 Across the chest we see a screen printed Canal New York text logo, and an adaptation of the brand's favoured Film Festival logo runs down the left sleeve. Both graphics come in white, perfectly creating a subtle, monochromatic colourway. Canal's short but very sweet Spring '17 collection, consisting of apparel and accessories, is available online here at Attitude and in our Colchester and Ipswich stores.